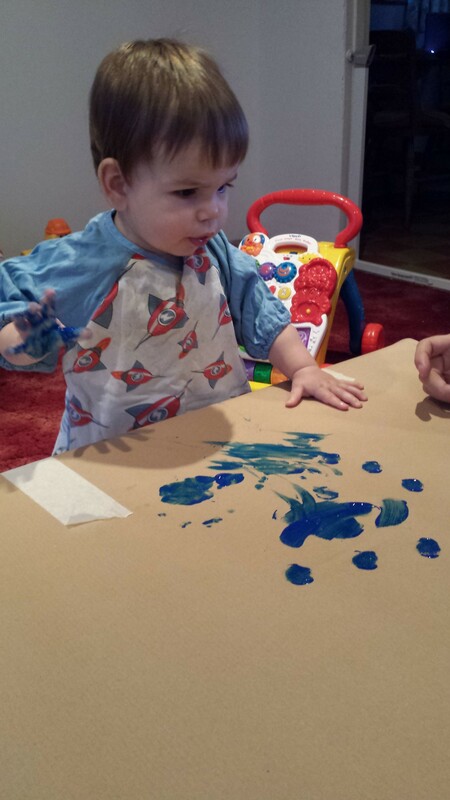 After checking the paint was non-toxic, covering the floor in a plastic mat, and covering the table in brown paper, we undressed you to your nappy and put you in a t-shirt bib. We were all set. Ready to make a mess, ready to make more memories, ready to make prints of your ever-growing hands, they were slowly losing their chubbiness, and mummy wanted to capture every change as you grew from a baby to a toddler. After 30 minutes of painting and 29 minutes of wrestling with you to stop eating the sponge dabber, we finally got a lovely clear hand print. It was time to pop you in the shower, after covering yourself in little hand prints, you had done an excellent job of turning yourself into a smurf. Mummy still has this little hand print on the fridge, a constant reminder of the fun we had in the short time we were blessed with you. Little did mummy know, your next hand print would be taken after you had died. Your hand I remember placing on mummy’s face as I held you at the hospital, to feel your touch, and to feel your skin on mine. I can still feel your little hand on my face now, and your not so chubby fingers entwined with mine. I held your hand for so long that by the time I couldn’t hold you any more, your hands were warm. I wanted so much to make you warm, to pull you so close to me that somehow my breath would warm you up, but it wouldn’t. Instead I cuddled you tight, your head resting in my neck. Mummy’s tears making their way down her face landing on yours, some would land on your eyes and it would look like you were crying. Mummy had enough tears for the both of us. When I was pregnant I would often think how amazing mother nature was. I would marvel at your perfect toes, perfect ears, perfect everything. I tried for so long to understand how all of your little features had grown and formed exactly as they should be, how, by eating food full of nutrients and sleeping well it would in turn look after you, keeping you healthy, my body nurturing you and keeping you alive. How it could even be possible that there were two hearts beating in mummy’s body. Now your little heart wasn’t beating any more, and as I laid there, with your hand on my face and my tears falling down your cheeks, it felt like mine had stopped too. As I lay there with you wrapped around me, I could not have felt more at peace with you in my arms. That’s where you belong, in my arms, I knew these moments were sacred. I knew these moments were limited and I knew my time holding you was running out. Nothing could prepare me for the moment that I had to place you in your coffin for the last time. It felt like I was closing the lid on my life, and the truth is, I was, you were my life and you still are now. That’s when the fear set in, knowing that I would never see you again, never kiss you again, never hear you again and never be able to hold you again. I had been the first person to hold you when you were born, I was the last person to hold you before you died, and I was the last person to hold you before the little lid was shut for the last time, the light being diminished from my life forever. This entry was posted in Uncategorized and tagged child death, child loss, death, grief, loss, memories, mental health, pain by amotherwithoutachild. Bookmark the permalink. Awwww Williams loving, heartbroken momma. A little piece of me breaks each and every time I read the pain and hurt pouring from the words of losing your sweet boy. But at the same time a little piece of me grows stronger when I see the pure adoration that you have and carry for him always. I’m just so sure that your little Grumpus is so proud to have you for his mummy that he brags and tells all the other little angels in his company “hey look, that’s my mummy and there is no other like her”. I want you to know that you make me proud as well, for reading your most precious thoughts and feelings has made me a better and stronger mommy for the little man I call Boogs, whom I adore and love more than anything in this world. Stay strong and bless you both always.